Kwon Rho-kap, aide to the late President Kim Dae-jung and a political symbol in the Jeolla region, announced Tuesday his much-expected defection from the main opposition Minjoo Party of Korea. His departure is taken as a sign that the Minjoo Party and chairman Rep. Moon Jae-in’s leadership will lose Gwangju and Jeolla voters, who have for decades remained supportive of the opposition camp. “For the first time in my almost 60-year political life, I have decided to leave my party of my own will,” Kwon, who had been acting as the party’s senior adviser, said at a press conference Tuesday. The political veteran, who had served three parliamentary terms, is expected to be followed by 40 or more party members, including senior incumbent lawmakers such as former floor leader Rep. Park Jie-won. Kwon directly pointed his finger at the party chief for being “self-righteous and exclusive,” and for creating a “pro-Roh hegemony” within the party. Moon, who was chief secretary to late President Roh Moo-hyun, has often been blamed for excluding conventional key figures and acting against the Honam (referring to the bloc of Gwangju and the Jeolla provinces) voters’ sentiment. Honam voters, whose support is considered crucial for opposition victory in elections, have increasingly grown apathetic since Moon, who is considered a political heir to Roh, took the wheel. The New Politics Alliance for Democracy, the former incarnation of the Minjoo Party, had formerly enjoyed 48-55 percent approval ratings in the area, according to local pollster Gallup Korea. But this figure dropped down to the low 40 percent range upon Moon’s inauguration in February last year, and dipped further to around 30 percent amid escalating factional feuds late last year. “There is no hope or future for a party that does not take responsibility for consecutive election failures,” the senior politician said. Kwon had earlier demanded that Moon step down and give way to an emergency council. The demand for Moon’s resignation was one of the key sticking points between the colliding factions, eventually leading to former cochairman Ahn Cheol-soo’s defection in December. He, however, hinted that he would not join Ahn‘s forthcoming People’s Party and that he will remain a supporter of the opposition camp in general. “Kwon’s defection shows that the Minjoo Party has parted with the Honam region for good and slipped into a leftist activist group, short of political legitimacy,” said third-term lawmaker Park Joo-sun, who had earlier defected from the party. Leader Moon held himself together and accepted the breakup. “(Kwon’s defection) reflects the public sentiment of the Honam region, and this we should accept with a humble heart,” Moon told reporters. 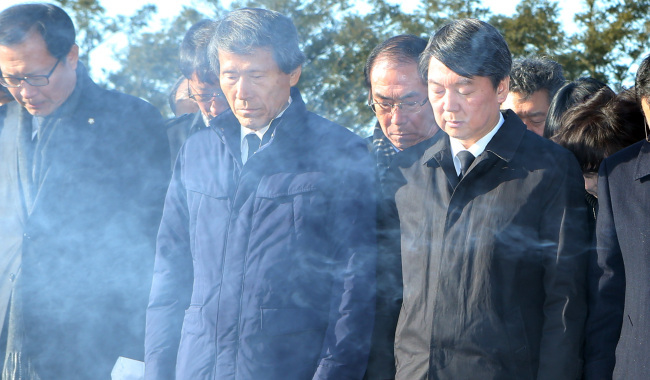 While the main opposition camp remained divided over the pro-Roh clique dispute, Ahn visited the late president’s Bongha Village in South Gyeongsang Province on Tuesday and paid respects at his cemetery. During his visit, some Roh supporters held up signs protesting Ahn’s visit, blaming him for splitting up the opposition.